Blue Badge Sat Nav goes the extra mile! This has been a long time coming and I’m sure plenty of disabled people and their carers breathed a sigh of relief when Navevo launched the Blue Badge Sat Nav, specifically for drivers with disabilities and their support staff. -Navigation directly to blue badge parking bays – extremely helpful if you have difficulty finding a parking space or knowing where the specified disabled parking area is! Additional information such as how long you are able to park in certain areas is also provided which is extremely helpful! -Local and relevant information – not only does this sat nav provide you with information about many points of interest around the country (over 60,000 different places) they’re also tailored to which are accessible and who they cater for. -Locating accessible amenities – from shops to train stations to toilets, finding accessible amenities is a daily struggle for many but with this sat nav, you’re directed to places which advertise said accessibility so there is no need to spend hours looking. These are just a few of the fantastic features made available through the Blue Badge Sat Nav and they are all designed to make life that little bit easier and they really do. If you’re not in the market for a whole new sat nav system but would like a solution to adapt your existing sat nav to support your additional needs you can also consider the downloadable points of interest (POI) software for TomTom or Garmin. This software contains some of the best features of the sat nav system including information regarding accessible amenities and also the essential Blue Badge parking bays across the country. It’s at a very affordable price too. A new sat nav is a big investment and something you need to take great care of. Use your Trabasack as a sat nav bag to safely transport your Blue Badge Sat Nav to and from your home. Store it in the bag compartment of your trabasack and you’ll never need to worry about it being stolen. The advice is not to leave a sat nav on show in the car window, so take it with you when sight seeing and shopping for peace of mind. We are very pleased that Trabasack is being sold as a travel accessory by those digital data wizards at the PIE Guide. If you are looking for a Blue Badge Holders Sat Nav update for TomTom is recommended by the trabasack team. Summer is here and we are glad to be getting out more. We like to visit National Trust properties and historic houses with attractive gardens. This gives us a chance to relax but also allows our son Victor to have a run around expend some energy. A common problem that we experience at places like these is getting into a busy restaurant with enough space to move. Often although they are big enough with no one inside them, once it gets busy you have got no chance with a wheelchair and a buggy! Unless you grin and bear it and ask virtually everyone to move, with lots of huffing, puffing, chair scraping with everyone else looking around, apologies and often exaggerated ‘getting out of the way’ manouvres by other well meaning members of the public. To avoid all this and because we try and make the most of the good weather anyway, we will decide to sit outside. Eating ‘al fresco’ usually means there is lots more space to move around but doesn’t always solve the problem of having an accessible table to eat from. The usual solution in public places is big picnic tables that do not do anything for wheelchair access. Wheelchair users cannot sit on the bench and people with reduced mobility also struggle to get onto and off of these style of tables. So despite their common use they are far from ideal. The only alternative is to sit at either end of the table. But being there you cannot reach the top of the bench to eat or drink from. This is where the trabasack is again a vital and useful travel accessory. It comes into its own in situation like this. With a trabasack you always have a level surface to eat or drink from wherever you are. In the picture below you can see Clare eating from a picnic bench using her trabasack Mini. She always carries one and so in situations where there are only park benches or picnic tables like the one shown she can still eat from an accessible surface. The Mini is lightweight and can easily be brought round to the lap from the back of a chair. It has a small beanbag in pocket on the underside so that it sits comfortably and levels on your lap. The upper tray top is an easy wipe clean PVC so it is hygenic for food use. As can be seen, you can rest plates and bowls onto it to eat from. Being small, black and because it looks like an ordinary bag, it is inconspicuous so you can feel relaxed using it. The Trabasack Mini or Curve can be taken anywhere and give you the opportunity to sit around an inaccessible table and eat with everyone else. Also the bag space can be used to keep cups, mugs, or anything that makes eating and drinking easier. Clare uses it to hold a china mug with a good handle, a knork and sometimes a straw or two, as well as her phone, purse keys and other items. 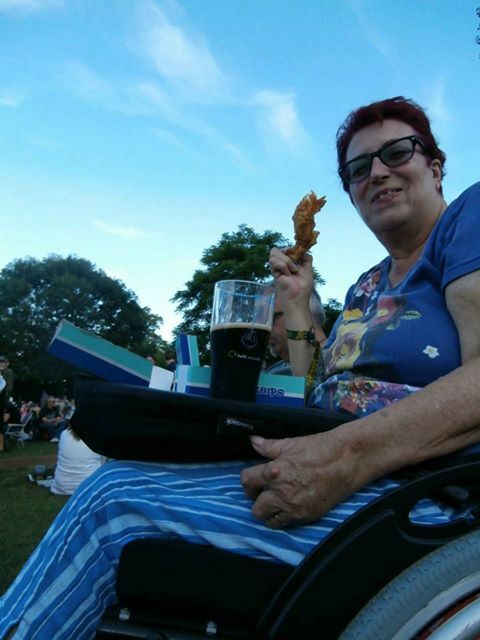 Trabasack is a unique product being a smart, attractive laptray or wheelchair tray and a bag in one, that makes wheelchair dining at picnic tables easy!